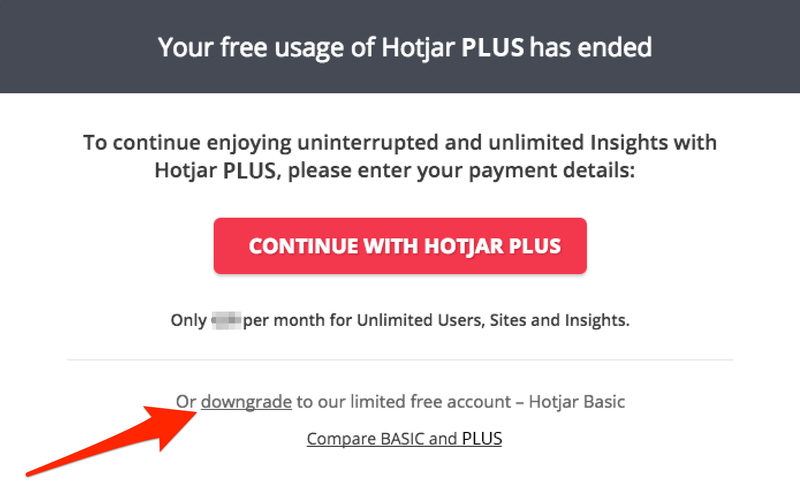 If you have not yet entered your payment details, you will be prompted to either continue on Hotjar PLUS, Hotjar BUSINESS or downgrade to a lower plan. To remain on our BASIC plan, make sure to click downgrade when your receive notice the trial has ended. If you've already updated your details, the credit card or Paypal account on file will be automatically charged on the displayed billing date. Your Plans & Billing page will flash a notice indicating that you do not have a payment method specified as well. You can update the information from this page at any time.